A bank holiday weekend means bank holiday weather and that's certainly what we've had over the last three days. From rain to sun, gales to, well, even more wind, it certainly put the brakes on what was supposed to be a camping trip to Pembrokeshire. On reflection I think we made the right call choosing bricks and mortar over canvas and by keeping a careful eye on the forecasts managed to get several decent walks in. 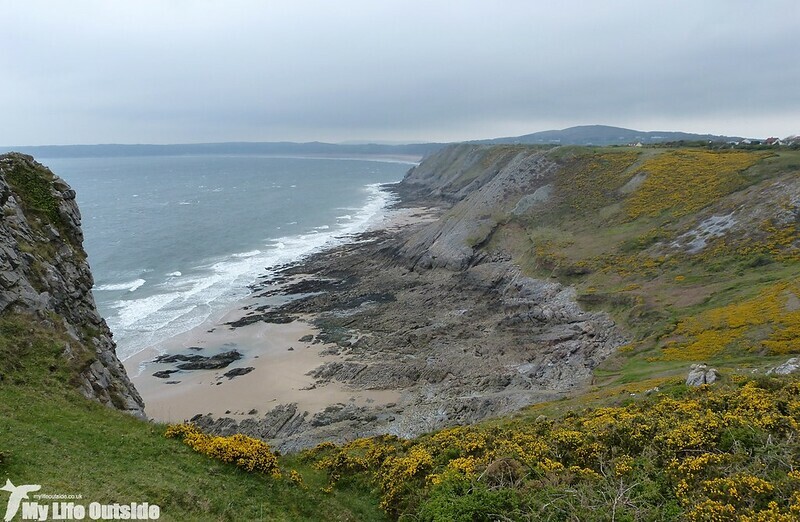 First up on Saturday was a route we've covered several times previously, starting at Southgate on Gower before taking in Pwlldu Bay and Bishopston valley. On a clear day the views are stunning but with low level cloud and those aforementioned gales blowing it took a lot of effort simply to keep the camera steady. 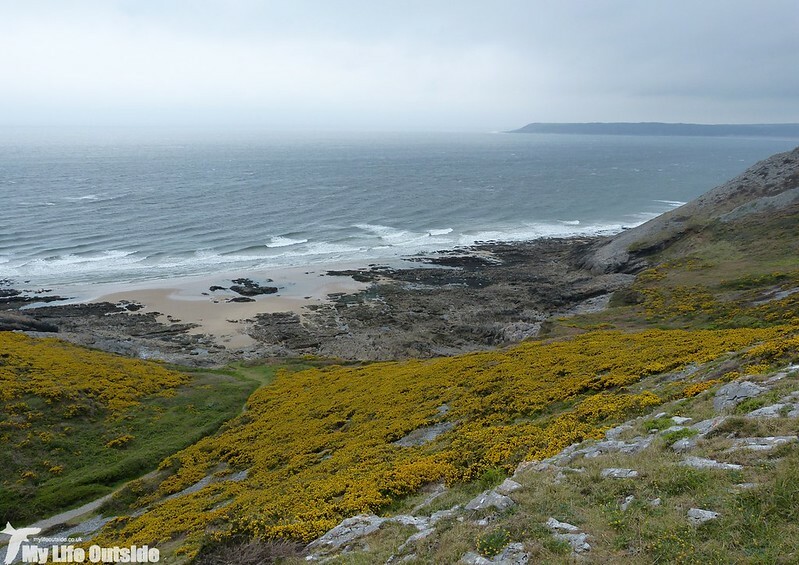 As with other areas this year the Gorse on Gower is full of flower creating a yellow blanket across the landscape which on days like this certainly helps to lift the spirits. Any sense of warmth however was only in the mind as the strong Easterly wrought a nasty chill that necessitated the reappearance of hats and gloves that I'd thought banished several weeks ago. In such conditions it was perhaps not surprising that birds were restricted to the big stuff with a lone Gannet loafing about on the sea, Ravens overhead and a Peregrine Falcon patrolling the cliffs below. Migrants were almost non-existent with just the calls of Willow Warblers emanating from deep within protective cover providing any hint that this was in fact still Spring and that we'd not somehow slipped straight back into Winter. Helping them along were a couple of singing Whitethroats but the hoped for Swifts? Not a sign. With backs bent against the wind we couldn't help noticing a smattering of hardy Bluebells poking up through the grass along with several Early Purple Orchids. All were dancing vigorously in the wind so instead I focused my photography on subjects slightly less mobile. Even these however were hampered by the murk. 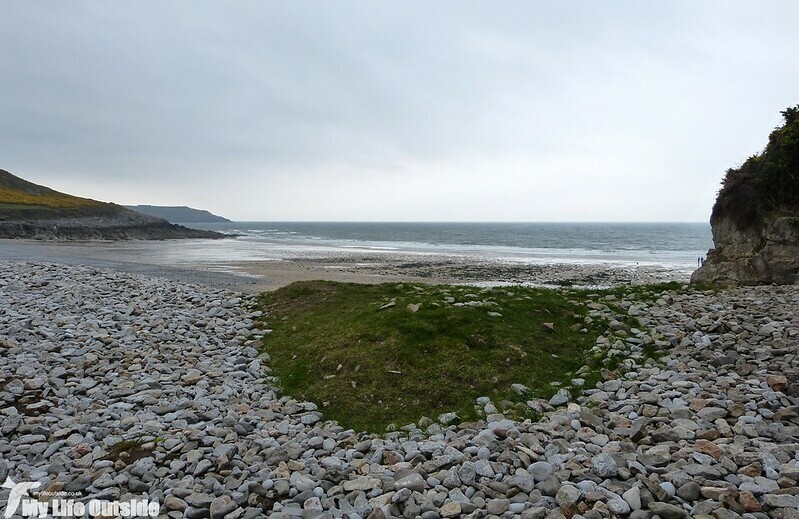 Pwlldu Bay is by no means a stranger yet there's something about it which keeps drawing me back. The area's industrial heritage and my own interests explain some of the reason why but in truth I find those shingle banks simply mystifying. There's nowhere else on Gower even remotely similar and in fact I'm having trouble casting my mind back to anywhere that shares a similar construction. 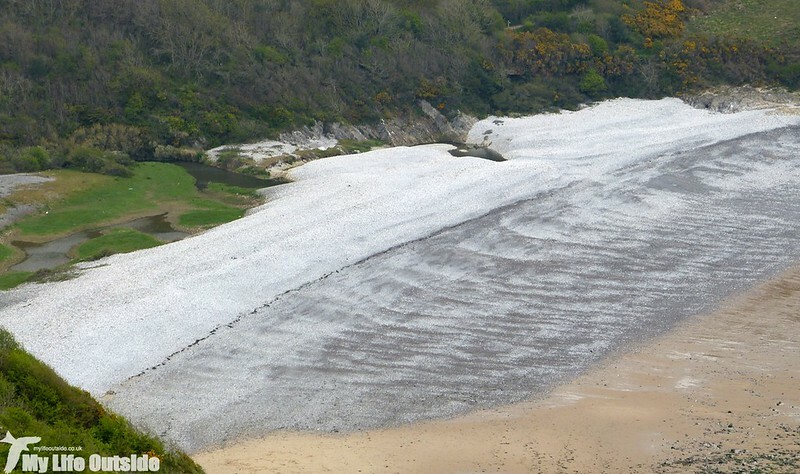 Initial thoughts suggest that the material has been piled up by the sea but closer inspection reveals the individual rocks to be rough and misshapen. No signs of having been rolled around in the surf here. In fact it's more likely that they're instead formed almost entirely from the detritus of limestone quarries which once operated here. Due to the length of time it took to load waiting ships, any rubble was simply cast aside and over the years accumulated to these impressive proportions. Today we had the place entirely to ourselves and after a spot of lunch turned landwards to walk up through Bishopston Valley. 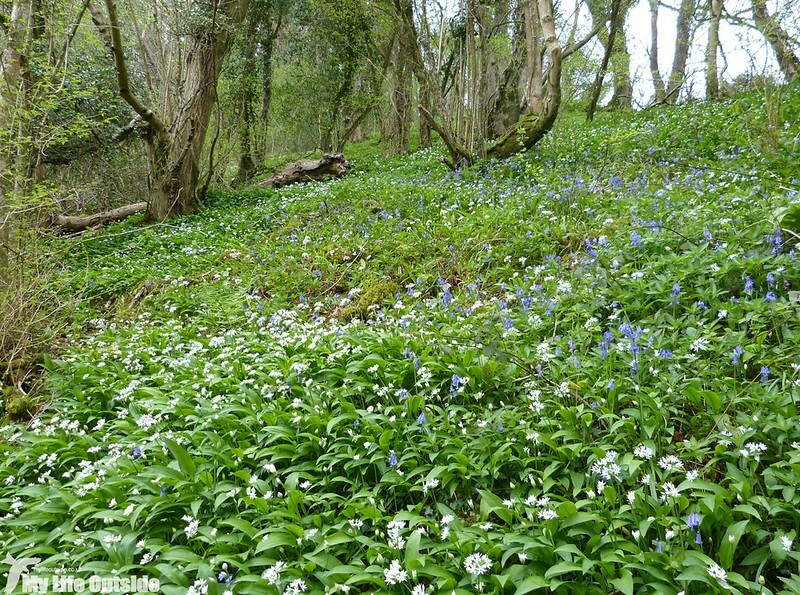 Where once men toiled extracting silver and lead today's visitor is left to wander through lush vegetation full of Wild Garlic, Bluebells, Wood Anemones and Marsh Marigolds; and those are just the species I recognised. 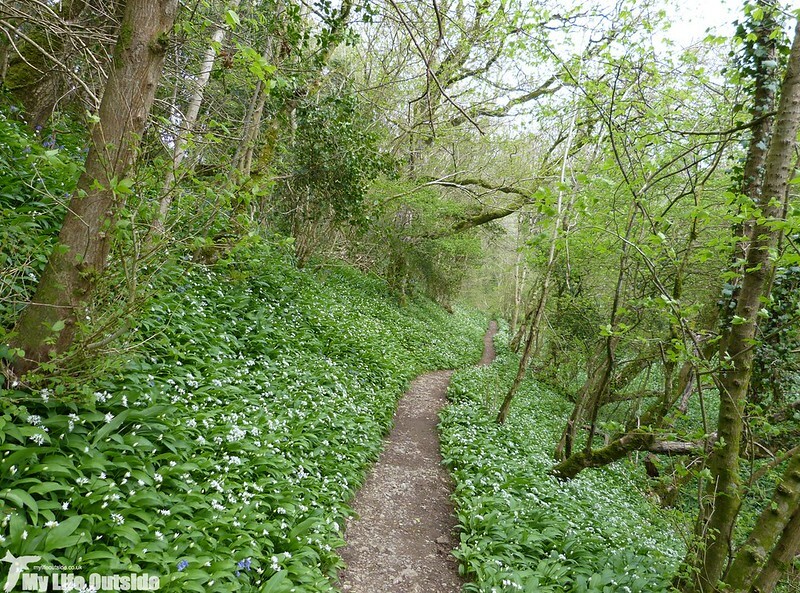 Sheltered from the worsening weather we were surrounded by bird song but the orchestra remained well hidden amongst a thickening growth of new leaves. It wasn't until we'd climbed our way back out to higher ground that we finally found a few Swallows zipping along a hedgerow, just as the first proper drops of rain began to fall. In the end we made it back to the car in the nick of time, windswept but refreshed and with fingers crossed for better weather come Sunday. you made the best of a bad job. Best you can do on a day like this.